Schulter® DESIGNBASE-SL is a wall profile that can be used as a baseboard alternative to create a clean, polished, finished look. It is available in anodized aluminum in either satin or brushed stainless steel appearance finishes or in aluminum in color-coated matte white finish. Installs easily to the wall with adhesive and it requires no maintenance. Use the optional sealing lip to protect the wall to floor transition from moisture penetration and reduce impact noise transmission. Profile length: 8 feet 2-1/2"
Profile heights: 2-3/8" or 3-1/8"
Does this product adhere to tile wall? 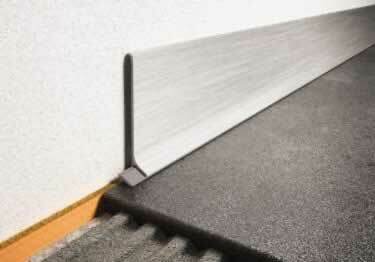 DESIGNBASE-SL is a wall profile that can be used as a baseboard alternative to create a clean, polished, finished look. It is available in anodized aluminum in either satin or brushed stainless steel appearance finishes or in aluminum in color-coated matte white finish.